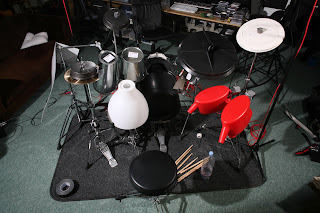 Just finished another interesting sample commission for Future Music magazine - we made a junk/pots and pans drum kit. Roping in our good mate (and honouree Groove Criminal) Simon Edgoose, we knocked up a kit of watering cans, buckets, plastic bins ect. We had a bit of trouble getting enough high end on the kit so we had to compromise a touch by including a single, frankly mullered cut down crash cymbal as a bottom hi-hat (a round backing tin was used for the top) and a crasher - a percussion thingy made of strips of metal. The snare turned out to be another problem as all the buckets and pots we had put aside sounded okay but wouldn't cut through when the rest of the kit was being bashed about. The end solution was an unlikely Ikea lampshade, upended on a snare stand. still did the job with a nice sharp, cross-stick crack. Luckily getting a good bottom end was no problem, in fact after we miked up the plastic dustbin with a Yamaha subkick it sounded too good! We rectified this by adding a dynamic mic and harder kick drum beater to bring out the 'bin-like' qualities. After mounting it all on cymbal/snare stands Simon gave it a thrashing.